Moose Mountain Click the image to enlarge and zoom in. Moose Mountain Roadless Area is 22,000 acres of triangle-shaped land flanked by Mallard – Larkins to the west, Kelly Creek eastward, and Bighorn – Weitas to the south. 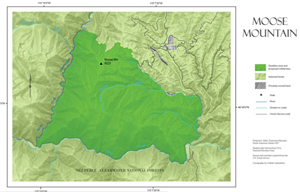 Situated between the Kelly Creek stream and the North Fork of the Clearwater, Moose Mountain represents a crucial region linking the aforementioned roadless areas. As its name suggests, it is comprised of the Moose Mountains, a series of peaks and ridges about 4 miles long extending north to south along the western periphery of the area, with Moose Creek Buttes extending southeast from the Moose Mountains. Elevation drops rapidly from the peaks, ranging from nearly 7,000 feet to just under 3,000 feet within a 1 – 2 mile horizontal distance. 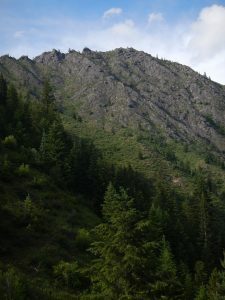 The entire area falls within a cedar-hemlock-pine ecosystem, though most of the land above 6,000 feet (dominantly the south-facing slopes) is barren rock or low, sparse vegetation such as shrubs and perennials. The north and northeast slopes are more shaded with lodgepole pine, Douglas fir, grand fir, western red cedar, western white pine, larch, and Engelmann spruce. Elk, mule deer, black bears, and a few Rocky Mountain goats find essential winter range, primarily on the shrubby, south-facing slopes above Kelly Creek. Moose Mountain, along with the surrounding roadless areas, has long been native habitat for the Gray wolf. Unconfirmed sightings of the threatened grizzly bear have been made amidst this furrowed country. The rugged terrain has few trails, making the area of interest to hikers seeking a challenge. Opportunities for solitude are not as great as in larger areas, though the area sees little use, as the region is curbed on two sides by a road and on one side by extensive timber harvesting. However, the major ridges offer outstanding mountainous scenery and the area’s modest size would allow a fit hiker to cover it in a day or two. Moose Mountain’s critical position linking other wild areas makes it an important consideration for full protection.